y o u s h o u l d p r o b a b l y d o s o m e t h i n g a b o u t a l l t h e e x t r a n e o u s s p a c e s , t h e y k i n d a m a k e i t h a r d t o r e a d .
I'm not saying variable-width nor ttf fonts (which are fun, but messy), just that non-square glyphs would really help readability (though perhaps not with CJK glyphs). 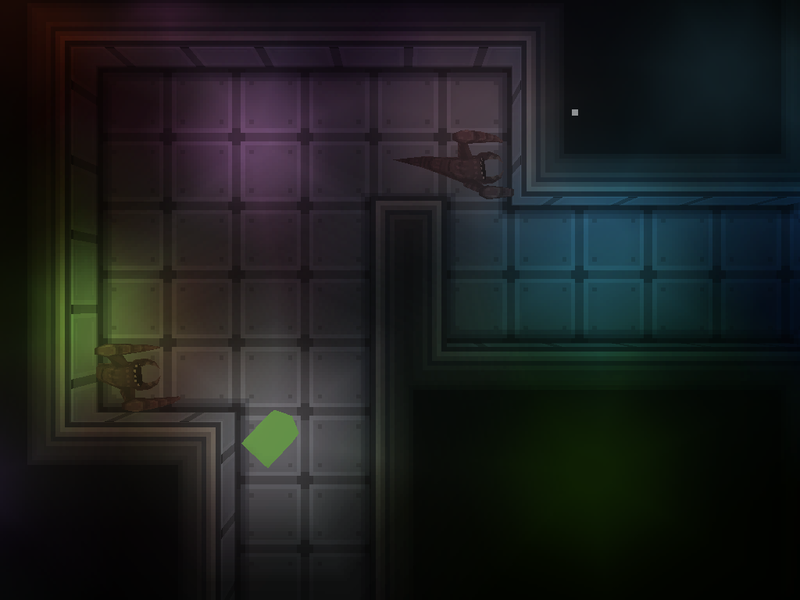 Been working a bit on procedural level generation for something roguelite-ish. 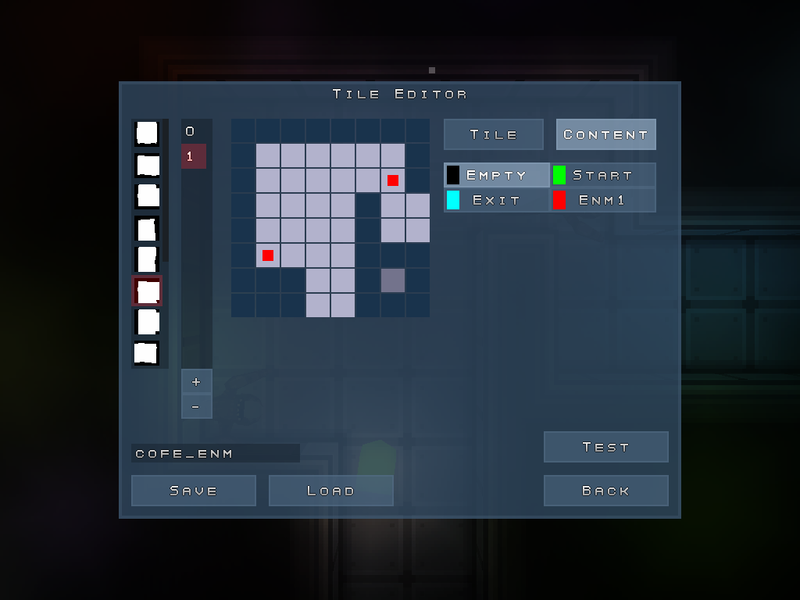 I first have it generate a 4x4 layout of meta-tiles using a somewhat simple algorithm that guarantees levels that aren't too simple and never have too long dead ends, and going to the exit never requires the player to go south by design. I improved the tile editor for the meta tiles, now you can save save and load tile sets, pick which category, and which variation of that category you are editing. still some minor bugs in it, and in the future I'll have more than just wall/not-wall as paintable types, like enemy and item placements. Then I implemented filling an actual map grid using both the meta tile map (in the first gif in the previous post) and a tile set created with the tile editor, spawning block entities in server qc for each tile and set their model/solid accordingly. Continuing from the last 2 posts, you can see the procedurally generated map in action in a top down shooter form, just with no enemies or anything yet. 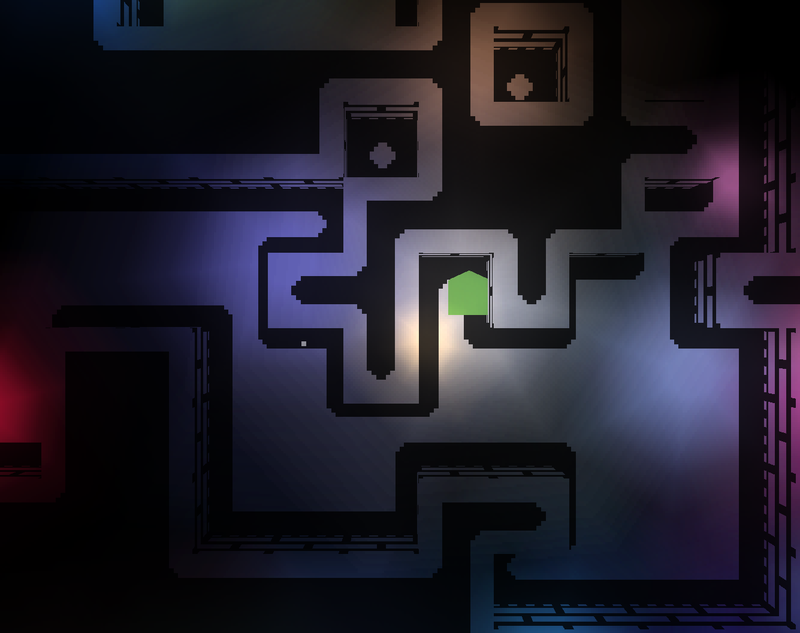 I did write a custom lighting system that works by rendering these circular light meshes on a texture and then overlaying that texture on top of a fullbright scene, works surprisingly nicely (but only in top down/2d-style views). More progress with the same project. 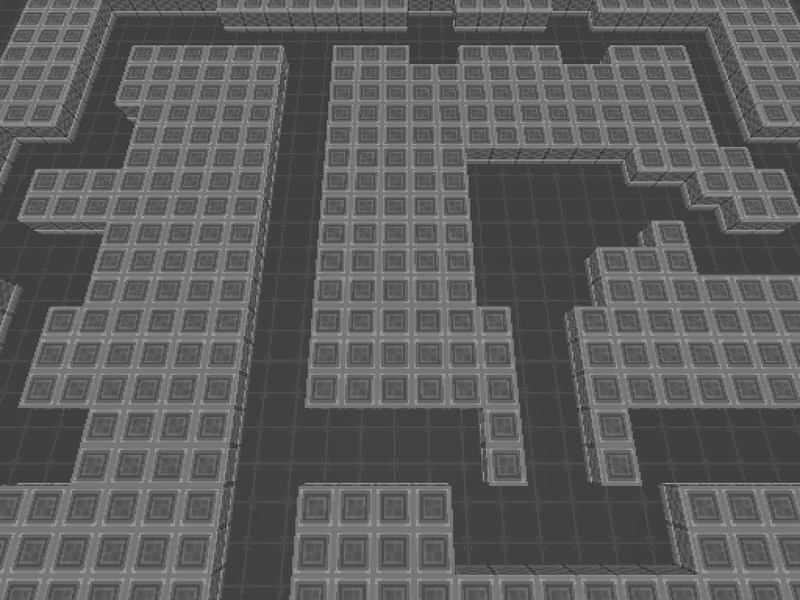 The map is now completely rendered using FTE's trisoup drawing instead of one entity per block, so I write all the map geometry vertices and indices in QC and when rendering I can draw the entire level with a single call (not counting actual entities like the player). This gives me a lot of control and in theory at least it should also be very fast. I also implemented a system to pick the correct texture for that particular block, so corners, walls, etc, all have the correct texture applied to them. How about the collision between the trisoup and the AABB entities ? I am very interested on this approach. The trisoup is purely for visuals, kinda like R_BeginPolygon, but with way less built-in spam, which should make it potentially much much faster. The collision in my case is handled with entities that are created on the server and the entities also tell exactly what types of blocks there are for the client so it knows how to draw the level using the trisoups. Thank you! Yeah I can go through it real quick here, Spike will hopefully clarify if I make mistakes. 1. Allocate memory for the vertex buffer (just an array of vertices), you could do this by just having a large array as a global but it slows down compilation a lot so I use memalloc and store the result in a global pointer. 3. You also need the index array which is integers, and the size of it should be the same as the number of triangles you want to draw. The indices is the indices of the vertices in the vertex buffer to link to create triangles, so indices [0, 1, 2] will draw a triangle that connects first, second and third vertex in the buffer. In my case I just allocated and generated a list that goes from [0, 1, 2, 0, 2, 3, 4, 5, 6, 4, 6, 7, ... ] for a nice quad pattern. Ahh, I see. You are just skipping the overhead of drawing individual models, but you still have one entity representing the tile, right ? Thanks for the explanation, shpuld. Thanks a lot Shpuld, really helpful! I'll definately try this out! I'm always glad to help! Some more progress! The tile editor can now place some entities and different tile types on the preset 8x8 meta tiles. The UI of the editor has evolved with it.